Flick through the Dogwood Cottage visitors book and you’ll struggle to find words that haven’t been penned before: “so secluded”, “so quiet”, “so friendly”, “so close to the pub!” The bulging book reflects the charm of this small site that has grown its custom largely through word of mouth, every visitor leaving with high praise and a vow to return the next year. Pitch up for a night or two and, nestling into one of the 15 prized pitches available, you’ll quickly realise what makes this place so special. 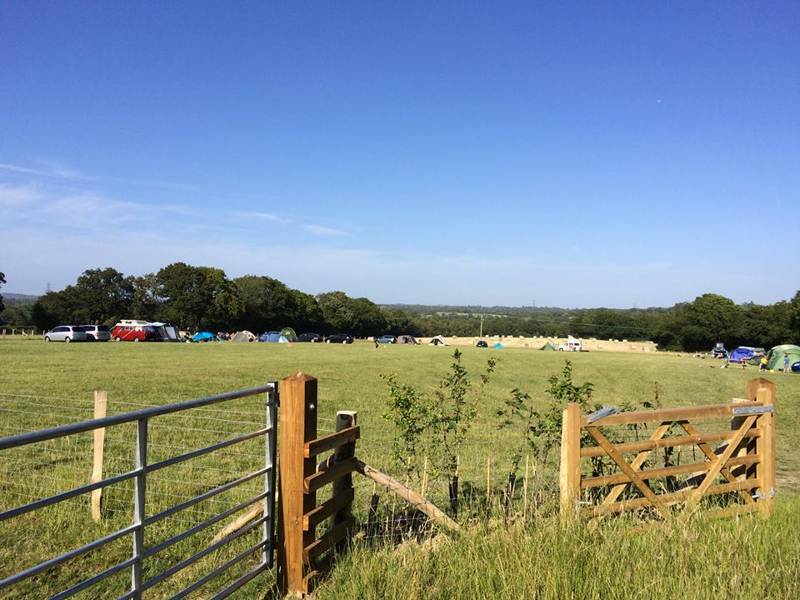 On the edge of Brede, a rural East Sussex village, this campsite is set in one of the countless grassy meadows that sweep across the High Weald Area of Outstanding Natural Beauty. The surrounding trees and hedgerows provide shelter, as well as somewhere for kids to build a den, while a woodland pond also attracts plentiful wildlife. 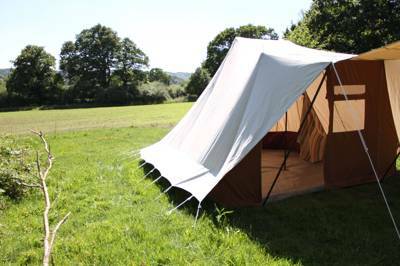 Sanitary facilities are fairly basic, with two toilets, a hot shower and a washing up sink, but they are faultlessly well-kept and, with just a handful of campers, these rustic necessities are all you’ll need. 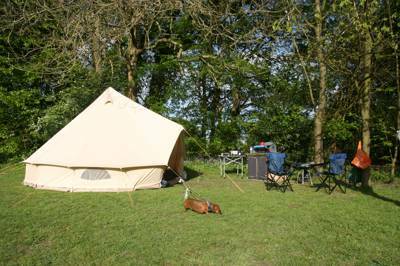 While the spacious pitches and secluded surroundings make for a winning campsite, the Dogwood Cottage experience really comes down to the friendly welcome you receive from Phil and Katy. 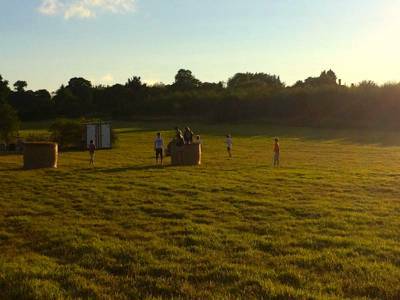 These laid-back owners are helpful, yet unobtrusive, and passionate about their local area. Stacks of handy information can be found in the onsite shop where you can pick up camping essentials, groceries and logs. Their friendliness also seems to exude into the village beyond, where two walkable pubs boast excellent food and the warmest of atmospheres. 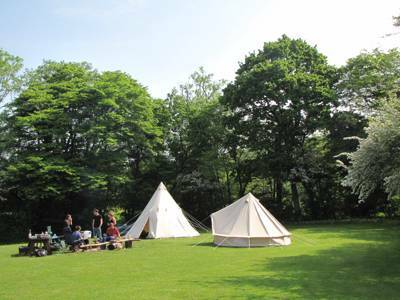 Despite its quiet countryside location, Dogwood Cottage Campsite is a short distance from a wealth of attractions, with the historic towns of Hastings and Battle just a short drive away. The nearest beach is just 15 minutes by car, while expansive Camber Sands with its famously dynamic dune system is five minutes further. The ancient town of Rye is just as close. Its half-timbered, skewed-roofed buildings clustered along cobbled streets are as quintessentially English as they come and refreshingly uncommercial. In the evenings, return to the campsite for some late night stargazing. With the village free of streetlights, the unpolluted sky is crystal clear. So, when the clouds are at bay, toast marshmallows round the campfire and keep an eye trained for shooting stars. A beautiful secluded campsite away from the hustle and bustle. A relaxed experience from start to finish. Phil and Katy were fabulous hosts as were the pygmy goats and chickens! Phil kindly helped get our campervan started when she had a flat battery. Nothing was too much trouble. Would definatley go back and recommend. We loved staying at Dogwood campsite, and Phil is a super kind and welcoming man. Everything was more than perfect, starting from the peace and calm which surround the place, the bonfires at night,to the friendly rabbits, hens and goats. Moreover, in the little shop it is possible to get some delicious vegetarian marshmallows and other organic goods. We definitely would choose it again and recommend it to everyone! Loved this site! 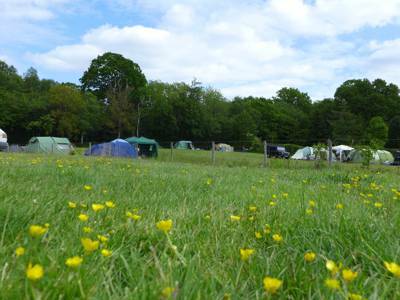 Beautiful location and the place definitely qualifies as a 'cool' campsite - lots of laidback character with really friendly and helpful owners. The facilities are basic but seemed clean enough to us and the shower was absolutely fine - hot and free, which is all you really want. Great to have a kettle and microwave provided in the information/ map room. Loved the walk through fields to the Red Lion village pub and the starscape on the way back to camp was just amazing - rare to have such dark skies in the UK. Best thing was the sense of nature on site with wild rabbits hopping about and I've never heard such a beautiful chorus of birdsong at dusk. All in all we felt we'd found a really special getaway and will definitely be back soon. Oh yes, and don't miss Phil's delicious organic bread if he's baking. Very basic sanitary facilities, 2 toilets, clean. No hot water to wash or wash dishes, you have to boil the kettle. Electric shower, clean, but if you are over 5ft 6 you will not get your head under the shower head. The toilet block smelt damp. Charged £24 for electric hook up for motor home... Think that's too expensive for the facilities. Quiet field with only 2 others on, but still had to wait for a shower, so wouldn't like to see it if more people there. Plots not marked out, most in heavy shade. Fire pits allowed but no sand/nearby water to put out if unmanaged. The best thing about this site is the short walk to the Red Lion pub. Won't return, facilities far too basic for money asked. 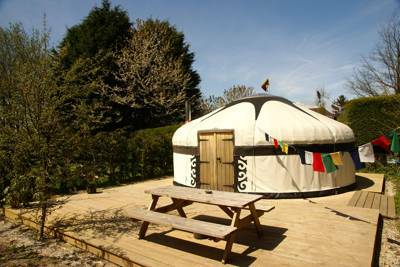 Lovely little site with very friendly, helpful owners. We stayed here during the summer holidays and despite being booked up it never felt too busy or full. The kids loved it and I'm sure we'll be back soon! Stayed here over the Easter break and had a fantastic time. Really lovely site. Very relaxed with hens roaming round the site. Great to be able to have fire pits. Owners are very helpful and friendly. Looking forward to next visit.! 15 pitches, 5 of which have electric hook ups. 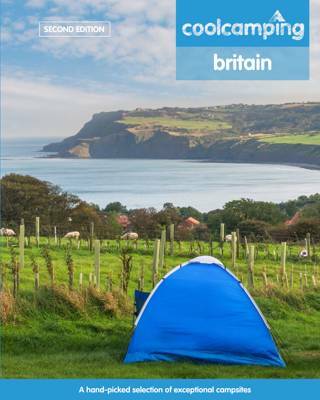 Tents, caravans, campervans, motorhomes and dogs. No groups. There are 2 toilets, a shower, an outside washing up sink and chemical disposal point. At the entrance there is an information room and onsite shop selling camping essentials, food and logs. Fire bowls are also available to hire. 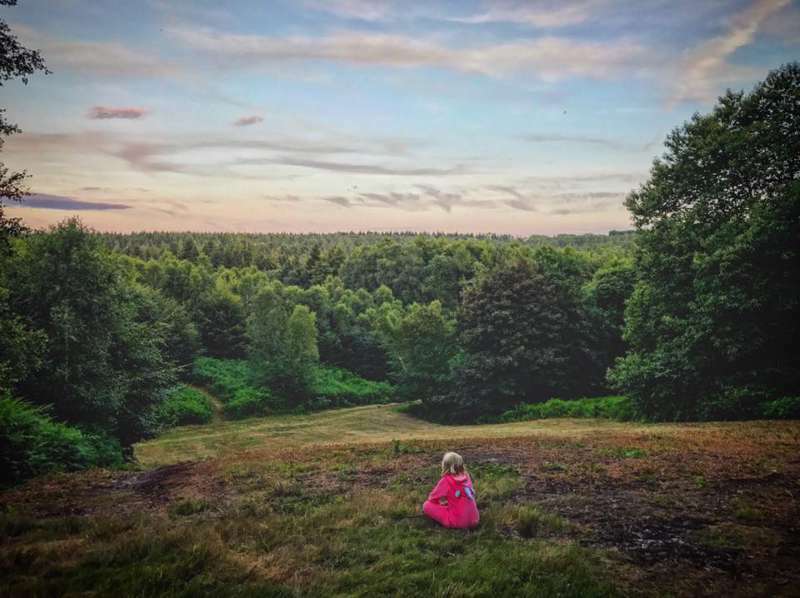 Amid the High Weald AONB (01580 879500), there are plenty of good walks in the local area while a stroll in Brede High Woods is a particular highlight, the stunning ancient trees are over 400 years old and home to an array of birdlife. Head south to the numerous beaches that are within driving distance, Camber Sands being perhaps the most well known, or stop at one of the coastal towns. Hastings is an excellent place, not only for its historic old town and famous connections with the invasion of 1066, but also for the spattering of fantastic seafood that can be found. Further inland, Battle, is where William the Conqueror defeated Kind Harold II and the spectacular Abbey (01424 775705) he built to commemorate the event also has a visitor centre with a wealth of information. History lovers should also visit Rye, a wonderfully unspoilt ancient port town. The 14th century Bodiam Castle(01580 830196) is a few miles north of the campsite, while Scotney Castle (01892 893820) and Bateman's (01435 882302), Rudyard Kipling's former home, are further but still less than half an hour's drive. Those hoping for something walkable need look no further than wine tasting in the Carr Taylor Vineyard (01424 751716) or The Giants of Brede (01323 897310), a steam museum with free entry. There is a small onsite shop selling food, seasonal veg, free-range eggs and camping essentials. The Red Lion (01424 882188) pub is just a short stroll across the fields serving great local seasonal British cuisine, while The Rainbow Trout (01424 882031) is a 15 minute walk towards Broad Oak and provides a great selection of meals as well as a sizeable beer garden. Both are dog friendly. Brede Farmer's Market (01424 813928) runs every Friday 10am - 12 noon in the village hall. It offers a fantastic selection of local produce and a warm welcome is guaranteed... as are a few delectable tasters as you wander round! There's also a convenience store within walking distance and a large Sainsbury's 10 minutes drive away. From £10 – £24 a night. See website for further details.